A gritty World War Two movie focusing on the United States Marines in the Pacific theatre, Sands Of Iwo Jima is a milestone military film, moving beyond flag-waving patriotism to mix intense training, fervent combat, and engaging characters into a potent broth. 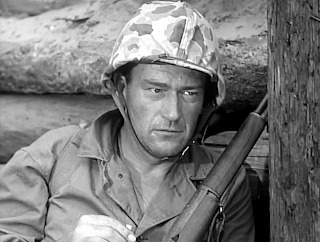 Sergeant John Stryker (John Wayne), a veteran of the Battle of Guadalcanal, is in charge of a squad Marines undergoing training in New Zealand. Stryker is battling depression due to a broken marriage and estrangement from his young son. Nevertheless, he is tough as nails and pushes his men hard in preparation for combat. Reluctant soldier Peter Conway (John Agar) grows to particularly resent Stryker, since Stryker served under and greatly admired Conway's authoritarian father. While on leave, Conway meets and falls in love with Allison (Adele Mara), and eventually they get married. Stryker's squad is thrown into action as part of the invasion of Tarawa, then they receive additional training and reinforcements in preparation for a much more difficult encounter: the battle of Iwo Jima. With the Japanese holding heavily fortified positions on the higher terrain of Mount Suribachi, Stryker and his men face a determined enemy and a bloody battle where success is measured in inches. Sands Of Iwo Jima does sometimes suffer from too many soldiers who are quick to engage in fisticuffs to settle petty quibbles. And some of the emotional drama used to humanize Stryker and his men is contrived, the script by Harry Brown and James Edward Grant perhaps erring on the side of too much inter-personal and introspective conflict within a small squad. But given that the film was made only five years after the end of the war, Sands Of Iwo Jima is remarkably progressive in focusing on the emotional toll extracted by the conflict. Director Allan Dwan invests substantial time in building up the characters within Stryker's squad, turning the movie into a study of men at war. 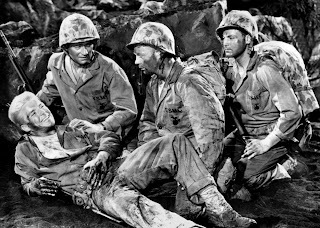 Ranging from the carefree to the tightly coiled, and brought to life by actors such as Forrest Tucker, Wally Cassell, James Brown, Richard Webb and Arthur Franz, the soldiers have hopes, fears, and frustrations, and readily express their emotions about each other and their superiors. The deepening antagonism between Stryker and Conway is the central story of the men struggling to cope with a world of war. Stryker is in a dark place, demoted by the Marines, abandoned by his family and regularly drowning his sorrows in alcohol. He vents his frustrations by being extremely hard on his men, to the point of physical abuse. John Wayne delivers a textured and Academy Award nominated performance, a hard man made harder but also more brittle by the ravages of war. Conway starts off in even worse emotional shape, having never cared to live up to his father's old-fashioned blood-and-guts expectations, and now saddled with a commander who idolized that same father. Conway yearns for a life of culture and enlightenment, away from the whole medieval concept of war, but even he understands that first there is an enemy to be defeated. In many ways a model for the post-war nation-building generation, Conway fights only because he has to, while men like his father and Stryker actually thrive in the war environment. With the soldiers given distinct personalities, the combat scenes, when they arrive, are powerful and violent, and Dwan edits into the movie, almost seamlessly, real combat footage from the Tarawa and Iwo Jima battles. The historical scenes emphasize the absolute agony and brutality of the conflict on the faraway Pacific islands. In Sands Of Iwo Jima there is still a war that needs to be won, but by the time the iconic flag of victory is raised, there is no denying that the scars are deep, the price is high and innocence is lost.